Before the advent of video games featuring blood and guts flying all over the screen, children had to be content with benign, peaceful, harmless games–like this one. 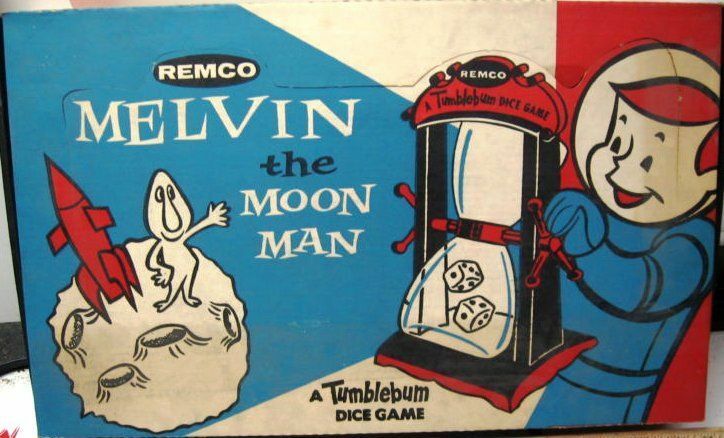 Remco put out “Melvin the Moon Man” in 1959, and it was a hit. My parents got it for us for Christmas, and it was simple enough for all three of us to play: my sister, age 4, my brother, 7, and me, 10. If we had had a cat, he probably could’ve played, too. You spin the handle of the unique Tumblebum dice glass (that, and the colorful graphics, were the game’s big selling points), and your plastic Spaceman traveled around the United Craters of the Moon collecting Moonbucks. The one with the most Moonbucks wins. No tactics or strategy involved. Just follow the map according to the roll of the dice. I don’t know what Melvin cost in 1959, but it’s selling on eBay today for up to $150. In 1959 anything over $5 was a major expenditure for my father which my mother would have to weigh carefully. They really must have loved us to buy us silly stuff like this. And that’s what makes this memory so sweet. This entry was posted on Saturday, June 9th, 2018 at 12:18 pm	and tagged with Melvin the Moon Man, my childhood, my family, nostalgia, Remco toys, vintage 1950s toys and posted in memory lane. You can follow any responses to this entry through the RSS 2.0 feed. « Too Little, Too Late for Europe? A lot better than video games. Melvin the Moon Man is a new one on me as well. I liked Parcheesi and Ropes & Ladders. Our favorite was Monopoly. My neighborhood friends and I played it over and over – we all became Capitalists. Interesting window into the past for me, being that I’m a Millennial and all.. I guess that makes you the nucleus of our Kiddie Korps. Recruit some more Millenials for us, OK? I enjoy your comments here. It’s obvious from your blog that you are living your faith. Thank you for that encouragement; it’s all by the grace of God. These are challenging times, but it’s good to know that subsequent generations still have people of faith. I loved this game as a kid in Seven Hills, Ohio. I probably received it for Christmas or birthday in 1960 when I was 7. I loved the astronaut game pieces and moon bucks and played the game to death with my brother and friends for years.